The DaVinci Jenny Lind 3-in-1 Stationary Crib is loved by many parents. For over 25 years, DaVinci Baby has been providing parents with the best supplies for their children. This particular crib is a 3-in-1 convertible crib that converts from a crib, to a toddler bed, and then into a daybed. While the initial price may be a bit more than a traditional crib, in the long run you will save money by not having to buy a toddler bed and daybed. The DaVinci Jenny Lind 3-in-1 Stationary Crib adds a classic vintage look to your nursery. This crib has a signature heirloom style with solid wood spindle posts. Included in the DaVinci Jenny Lind 3-in-1 Stationary Crib is just the crib. The conversion kit that turns the crib into a toddler bed is sold separately. This is somewhat of a disadvantage, since some of the convertible cribs include the conversion kit in the initial price. It's important to remember what is included when you are comparing prices. Also sold separately is the mattress. It is fairly standard with most of the baby cribs on the market to sell the mattress separately. When buying a mattress, it is very important that you buy one that fits into the crib snugly. A gap between the crib and mattress creates a safety hazard. The DaVinci Jenny Lind 3-in-1 Stationary Crib is very easy to put together. With some cribs it takes at least two people to put it together. Spending a whole weekend to set up a crib can be a frustrating experience. With some pieces of furniture you need all kinds of tools, time, extra hands, and know-how. But have no fear with this crib. With the DaVinci Jenny Lind 3-in-1 Stationary Crib, one person can easily assemble this crib. Most parents said that they put this crib together in less than 20 minutes. This crib meets all of the current safety standards. One thing to keep in mind when purchasing a baby crib is to make sure that it has passed all of the safety standards. That's why it is very important to use extreme caution when accepting an old crib as a hand-me-down gift. For example, we now know that drop down sides are not safe. We also know that the slats have to be closer together so heads don't get caught. This crib has been screened for over ten thousand chemicals. It is finished using a non-toxic multi-step painting process. It contains no lead nor phthalate. After reading many parent reviews, it is clear to see that the DaVinci Jenny Lind 3-in-1 Stationary Crib is a very strong crib. Many families said that they took it apart and put it back together and moved it to rooms several times without the crib loosing any of its strength. When a product does not hold up, people will make sure to leave comments about the problems they experienced. But the the comments left about the durability of this crib were overwhelmingly positive. The dimensions are 36.25 inches in length by 19.25 inches in width. This crib stands 39.75 inches high. The DaVinci Jenny Lind 3-in-1 Stationary Crib weighs 22 pounds. This is a good crib for short parents. With a height of only 39.75 inches high, short parents found it easy to set down and pick up their baby. Most parents liked the size of this crib. The DaVinci Jenny Lind 3-in-1 Stationary Crib is not an overly big crib. It is smaller than many of the standard size baby cribs. Though keep in mind that this is also not a compact travel crib. If you are wanting a small crib to be mobile, this would not be a good choice. This crib is made to stay put. A common comment that I kept reading from parents in the reviews, was that The DaVinci Jenny Lind 3-in-1 Stationary Crib looks more expensive than it is. This is a very affordable crib. Sometimes when you buy things at a lower price, quality is sacrificed. But that is not the case with this crib. This is a great crib at a great price. One thing that I thought was pretty neat about the DaVinci Jenny Lind 3-in-1 Stationary Crib is that parents liked how it went with all decors and styles. This crib will fit in with a modern or vintage look and everything in between. The comments were overwhelmingly positive about the looks of this crib. Many comments were about how clean and neat the appearance of this crib is. Many parents shared photos of their child's nursery with the DaVinci Jenny Lind 3-in-1 Stationary Crib in it. The DaVinci Jenny Lind 3-in-1 Stationary Crib is unique in that it has wheels on each leg. This is a nice feature if you plan on moving your furniture around. Sometimes it's nice to stir things up and completely change a room. Though the wheels make it much easier, it was interesting for me to learn that most parents did not like the look of the wheels on this crib. Many that did put the wheels on chose to take them off. 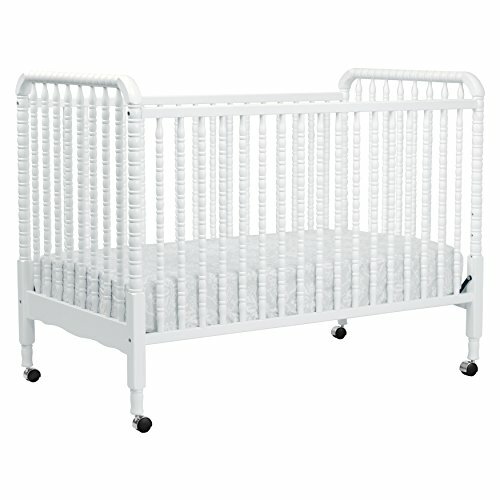 The DaVinci Jenny Lind 3-in-1 Stationary Crib is truly a great crib with a great price tag. If you would like a piece of furniture that your child can use from infancy through and beyond the toddler years, then this crib may be exactly what you need. It starts off as a crib, then converts to a toddler bed and daybed. The parent reviews are very positive. People who purchased this crib said that it was both sturdy and attractive. The fact that it can be set up quickly by one person is an added bonus. I hope my review of The DaVinci Jenny Lind 3-in-1 Stationary Crib helps you decide if this baby crib is right for your family. To see all our baby crib reviews, check our out article The Top 10 Baby Cribs of 2018.